Peter Matanle is Senior Lecturer in Japanese Studies and Director of Research and Innovation at the University of Sheffield’s School of East Asian Studies. He researches and teaches about Social and Cultural Geography. His current focus is on regional development, population and environment in the Asia-Pacific, particularly Japan and New Zealand. More information uploads of publications and talks, and contact details can be found on his Personal Website, Academia Profile, University profile, and Twitter. The successful development of Japan, and now the rest of Asia, has been a seminal moment in human history, and no one should underestimate Japan’s spearhead contribution to leading Asia along that pathway. When I was young, Japan was alone in Asia as a rich developed country. Now many regions of Asia are rapidly attaining developed status or progressing towards that. China is becoming open to the world and expanding its own huge potential. There is an enormous transformation taking place that has global consequences. Experiencing and observing that first hand, and communicating about it have had an enormous impact on me as a researcher. Going to live in Japan in 1987, and living there on and off for 13 years since then, has had a profound impact on my life and my way of thinking. I lived for a year in a tiny Japanese mountain village of fewer than 300 people. I didn’t have a driving license, there were no trains, and there were about three buses a day to the city more than two hours away. There was no internet at that time and I was the only non-Asian resident. In those circumstances you either learn Japanese or you’re lonely. So you learn the language and make friends with the people around you, getting to know what they’re thinking about, and talking about those things in their language. Having to do that forced a huge change on me as someone of relatively privileged male Anglophone background that had never been seriously challenged in that respect. It has been painful at times confronting some home truths about myself and where I come from, but I think the experience has given me a rare opportunity to contribute to understanding global issues in their broader and deeper context. I think that every British leader should undergo an experience like that because it really helps you understand what it is like to be the ‘other’ – even if for a relatively short-time and in a rather sheltered way. The opportunity to live elsewhere, outside of Europe, to learn to speak a very different language from my own and to see the world, even explain myself through someone else’s words and grammar, have completely changed the way I think and behave. As a post-imperial power that still retains so much of its imperial values, I think we need to think very deeply about how we in Britain relate to the rest of the world in the 21st century. We are in danger of losing our place precisely because the rest of the world is changing and progressing, and we are not. I am now much less sure of the rectitude of western, Anglophone, ways of thinking and their solutions to the challenges we face, and much more aware of the efforts going on elsewhere. Now living in the UK, when I am confronted by people who haven’t undergone thinking through someone else’s perspectives, how narrow their worldview and limited the future opportunities they perceive for themselves can occasionally be. It doesn’t always win me friends at home, but I think it gives me an opportunity to challenge British people and offer up alternative viewpoints, pathways, and solutions. Where do you see the most exciting research and debates occurring in your fields, particularly the socio-cultural geography of the Asia-Pacific region? In the Social Geography of East Asia, for me the most important issues are environmental and socio-economic, with respect to how East Asian countries are able to balance their understandable desire for economic development, and the urgent global need to achieve environmentally sustainable living. One of the big issues to look at is how each country achieves its goals, when balancing different countries’ needs and state of development within the international system as a whole. Japan is a rich developed country whose environmental footprint per capita is high. China, by contrast, has a lower per capita footprint, but its huge population means that any developmental and environmental changes occurring there have global consequences. So one interesting question that emerges is how Japan and China may be able to work together, if they are experiencing similar developmental pathways but are at different stages along those pathways. How could Japan’s and China’s experiences connect so that similar rates of developmental acceleration can be achieved in environmental issues in the 21st century, in the same way as the East Asian Development process was transmitted from Japan through the rest of the region in the second half of the 20th century. I don’t want to say that these pathways are determined or that China is purposively following Japan into a particular type of socio-economic development, but it is fairly obvious that there is an East Asian model going on. Japan’s experience therefore might be helpful when we ask the question, what happens when you get to the other side of that growth phase? Japan has passed well into the ‘shrinkage’ phase. Can China learn from that? For me, this is a really exciting question. Interestingly, if you think about China and Japan’s historically difficult diplomatic relations, it may even be that this sort of cooperation might help to alleviate those issues, too. Do you see China and Japan working together more in the future, especially since many IR theorists see China as the next superpower? Japan and China are already working closely together in so many ways that are not discernible when you focus on the state-to-state level, which the international press and those interested in international relations tend to do. The difficulties that are occurring between those two countries at that level over the decades obscure many of the good things that are occurring at the region-to-region, locale-to-locale, organisation-to-organisation, and individual-to-individual level. There is a tremendous amount of cooperation going on already between the two countries. Many Chinese people live in Japan and Japanese people in China, living and getting married there, setting up companies and employing people, and so on. What we need to do is find how we can all assist in the cooperation already occurring, and accelerate the process of achieving environmentally sustainable living, environmental restoration, and fixing some of the damage we have already done. These are really urgent and pressing issues not just between the two countries, but worldwide. So, I think one might not focus so much at the state-to-state level, but other processes of international cooperation and how to harness those. It often does happen at the local level and, of course, it is local people who have to be involved when dealing with, for example, farmland, forests, coastlines and so on. National governments can only do so much. 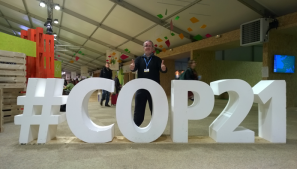 Presenting your research at COP21 in Paris, you focused on your idea of the ‘depopulation dividend’ (the long-term environmental gains from reductions in the global population). What are the key steps, and how long must Japan and the Asia-Pacific region take to achieve such dividends? It was an incredible privilege to be able to attend the Paris Conference. I met some really warm, intelligent, compassionate, committed people there. I think it is important to state, also, that they are not naïve as sometimes they are apt to be portrayed. I hope very much, and expect, that the aims of the Paris Agreement can therefore be realized, and possibly that research on depopulation might contribute to that in a small way. I came up with the expression ‘depopulation dividend’ at the International Population Conference in Pusan in 2014. I met some people there who were saying that there are too many people on earth, and that we need to halt global population growth, even reduce the number of people on earth, because of anthropogenic environment pressures. I think it is right to say that human population expansion worldwide has had a huge or even catastrophic impact on the earth’s natural systems, but to assume population reduction would automatically reverse those losses is logically inconsistent. The two are not the same. So, we haven’t done nearly enough research on whether the reverse would transpire automatically as and when population losses occur. We have to understand that there are thresholds of depopulation. There are, for example, significant lags even as the fertility rate drops. In these cases, the country’s population will continue to grow even as fertility drops, because the difference between the death rate and the birth rate is what determines population changes in the short term, rather than fertility rates, which have longer term effects. Another threshold is the point at which the number of people in the labor force stops growing and starts to shrink. All are signals that tell us that depopulation will occur if circumstances persist. This is what happened in Japan. Even in the late 1950s, the net reproduction rate fell below the population replacement rate of 1.0. Then in 1974, the total fertility rate dropped below 2.1, followed by the working age population beginning to shrink in 1995 and the labor force declining in 1998. Then in 2008, the Japanese population started to decrease. All these dates were key thresholds. Most countries in East Asia are experiencing these thresholds, but are yet to experience depopulation. What we need to think about is what happens after that point, when growth stops, whether we can reverse environmental losses and whether environmental restoration occurs naturally, as some expect, or needs human intervention. So far I think that it will take a long time to realise a significant depopulation dividend from resource consumption, such as energy for example, without coordinated intervention by governments and other actors. For example, a bank branch I went to in a rural city in Japan used to house 200 employees. Now there are about 20 people occupying the same open plan office space. The whole building still needs lighting and heating, even though only 10% of that bank is occupied compared to 20 years previously. That is a huge cost for that bank, and it eventually closed down. Consequently, there are inefficiencies and lags built in to the depopulation process. So, when looking at biodiversity losses and the potential for environmental restoration, the sort of ‘natural’ depopulation that is occurring in Japan due to long-term below replacement fertility, compared to the sort of enforced depopulation that was experienced near Chernobyl in Ukraine, has very different outcomes. Think of a scenario where a farm settlement might become abandoned, resulting in a small area of overgrown farmland, but the area around is still being worked by other farmers. You don’t get the necessary contiguous land for natural afforestation to occur and larger mammals to extend their predatory ranges in the way that natural expansion of wilderness would demand. If depopulation is to be taken advantage of as a method of wilderness and biodiversity restoration, it has to be a coordinated process of land consolidation to free up contiguous areas to return to nature. This is a very complex process involving the central government, local authorities, and contributions from people who voluntarily move away from their homes. Therefore in order to realise any kind of depopulation dividend, it needs to be planned, requiring research to identify which policy levers would be effective. And of course, this does not even consider the law of unintended consequences. I appreciate that rapid population expansion has had a catastrophic effect on the earth’s population, but it is perhaps naive to assume that a reversal of population growth would automatically reverse some of those environmental losses. It doesn’t happen that way and that is the research that I’m trying to establish. We can achieve dividends in lots of areas, such as with reconfiguring the built environment, closing down and removing little used infrastructures and buildings, consolidating farmland, returning land to wilderness, and reintroducing species that have become extinct locally. It’ll take as long as authorities want it to take. I think, practically speaking, that it’ll depend upon the political willingness of national, regional and local governments and political alliances to acknowledge the issue and then to realise its potential and implement practical measures to realise dividends. But there may also be social outcomes, such as greater gender and ethnic equality as labor markets become tighter and employers feel a more pressing need to provide opportunities for traditionally lesser-represented groups in the labor force. There may even be opportunities for promoting greater access to educational opportunities, which is already happening in Japanese higher education. In this sense, the Japanese experience shows, for example, that labor markets get tighter before depopulation actually begins, because of ageing as an outcome of both low fertility and extended longevity, and which begins to occur long before depopulation. So, as aforementioned, there are various thresholds to watch out for and opportunities that come from these, even before a country begins to depopulate. Should other high-consumption countries that are to experience ‘life beyond growth’ (depopulation) in the near future emulate Japan’s approaches? Right now, I don’t think that the Japanese government is consciously trying to realise a depopulation dividend, despite the fact the depopulation is well established and well known there. It’s politically very difficult even to acknowledge, let alone promote the idea of shrinkage being a ‘good’. We are so wedded to the idea of growth being a good thing; it is deeply embedded in our culture and way of life that shrinkage and decline are nearly always considered negative phenomena. Japan is no different in this respect from elsewhere. That being said, there are some people in some areas doing good things to take advantage of the new circumstances they are in to try to think, act and live beyond growth. What we might potentially learn from Japan is about how Japanese people and local authorities are coping with the outcomes of depopulation in their own lives, particularly how innovative they can be. So this is a good chance to go beyond standard approaches in international relations that tend to look at the state-to-state level of interaction, and consequently treats countries as uniform and unitary entities. There is tremendous variability of behavior within states, as we all know, and there is potential for increased international cooperation at the regional, local, and individual levels. This is not intended to be anti-state or to bypass the state in any way, just to supplement and bolster the good things already being done at the state-to-state level. Research at the regional and local level would be a fruitful contribution to understanding the dynamics of population shrinkage and its environmental outcomes, and how the information might be transmitted and used elsewhere in East Asia. Interestingly, on the state level, the Japanese government has not gone for the short-term apparent solution to shrinkage of enormously increasing inward migration. Japan is, however, encountering labor shortages that are very much to do with ageing and depopulation, so we can expect Japan to immigrate larger numbers in the future, but in response to satisfying the economic needs of Japanese employers, rather than as an attempt to balance population numbers per se. Environmentally speaking that might not be a good thing, since inward migration would likely mean a higher rate of overall consumption when measured cumulatively, as migrants tend to come from low per capita consumption countries and move to a higher per capita consumption country, such as Japan. Again, I haven’t seen anyone calculate what kind of a change would occur, but I think it is worth investigating and I aim to do so very soon. However, I would caution against a negative outcome to that investigation contributing to ethno-nationalistic and isolationist political excuses for limiting migration and cutting off poorer people’s life chances. But, so far, the Japanese government has not gone down that path. Your recent work has also explored New Zealand’s experience of depopulation (at the subnational level), a country with high immigration. What role could immigration play in creating sustainable post-growth economies and societies? Well, I was fortunate enough to be invited to New Zealand to work with Professor Natalie Jackson, who is one of Australasia’s leading demographers. She leads a research project into New Zealand’s changing demography titled ‘The Ebbing of the Human Tide’, whose results will be published this month in Policy Quarterly, a practitioner focused academic journal produced by Victoria University of Wellington. New Zealand is a high immigration and a high consumption country, but is experiencing depopulation processes at subnational levels of analysis, in some provincial rural regions particularly in the South Island, mostly as a result of population ageing and rural out-migration. Overall New Zealand is still growing as a whole and is not about to begin shrinking any time soon. Most migrants end up in Auckland or other urban areas such as Wellington, Hamilton, Christchurch, and don’t go to live in rural areas. So, their consumption patterns are rather urban in their composition. That could mean that they consume less than rural dwellers, since they might rely more on public transport and less on cars, or they live in apartments rather than houses. But it also could mean they consume more, because they might spend a lot of time and money on leisure pursuits such as international travel. Importantly, New Zealand is a small country, population wise. The country as it is today was built precisely on a model of high immigration, and it is still small enough that it only takes a small number of migrants to establish population stability. Their fertility rates are still pretty high among developed countries, meaning they can more or less maintain their own population. Indeed, the country is still growing even as the fertility rate drops slightly below 2.1, due to high rates of international migration mostly. New Zealand takes a mixture of migrants from different types of backgrounds. Some are even members of the global nomad super-wealthy class, whose consumption patterns are very high because they possess multiple residences worldwide, ocean yachts and so on, and a property in Auckland for them is desirable for various reasons. But most migrants to New Zealand are still from the Anglophone world and Europe, though some are from Asian countries, especially China. For Japan to adopt a policy of using immigration to achieve population stability is a whole other question, because the country is very large in population terms – currently eleventh in the world, having been recently overtaken by a rapidly growing Mexico. Japan has experienced low levels of fertility since 1974, which means that every woman in Japan of childbearing age was herself born into a low-fertility society. Consequently, small families are now embedded into Japanese culture. If you think of the demographic outcome of many decades of low fertility, Japan could not possibly balance its population by immigration. It would need to immigrate many millions of people, and where would they come from and what would they do in Japan when they got there? How would Japan change as a country? These are all important questions that everyone needs to face up to. So, for Japan, immigration can only ever be used to provide a softer landing for a slower rate of population decrease. It could never be used in the way that New Zealand has been able. The numbers required are truly staggering; there just aren’t that many people available. For example, China is ageing too and about to begin depopulation. They would want to keep their younger people with economic and reproductive potential and not lose so many of them to Japan. For a lot of reasons, I don’t think this is realistic for Japan, and I think the Japanese government knows that, and that’s why it has not chosen to go down that path to any appreciable degree. But, to get back to the environmental impacts of immigration into a depopulating country, again so little research has been done on these things that we are still only making intelligent guesses, which might end up being confounded by methodologically rigorous research. I’m just starting out, and want to make much more of a contribution from studying different depopulation environments and scenarios, with immigration being one important issue to consider. Do you think depopulation and its spatial implications could change the way in which diplomacy and states operate with each other (e.g. immigration treaties)? It could well do. I seem to remember that Lee Kuan Yew, the first Prime Minister of Singapore, once said that depopulation might actually promote world peace or reduce armed conflict, because countries would be less prepared to sacrifice their younger people. That is one way depopulation may affect relations between states, and I don’t think it is a fanciful concept. It is really significant that Japan’s depopulation is quite unlike most population changes that have occurred in the last 200 or 300 years, which have almost always entailed rapid growth. When depopulation has occurred it has been due to war, famine, disease, disaster and so on. Moreover, there are now other countries beginning to experience similar phenomena. So, one thing to caution against is to think that this is unique to Japan. Indeed, it is ‘the new normal’ for North-East Asia, as well as perhaps some other areas of the world, including Southern Europe. Depopulation is not simply a question of rural to urban migration. It is more significantly an outcome of long-term low levels of human fertility, with population ageing as an intermediate stage. So, in previous decades Japan experienced depopulation in rural areas even as the country’s overall population was growing very rapidly. The result was very rapid and extreme urbanization, particularly around the Tokyo area. But what we are seeing now is the whole country depopulating, which means that most urban areas are for the first time also shrinking. This phenomenon produces a zero-sum game within the nation. If one settlement such as Tokyo continues to grow – Tokyo is so huge even a small rate of growth would involve a very large number of people – other areas in Japan necessarily have to shrink. That relationship is a cast-iron mathematical certainty within a shrinking population. So, in this scenario even most urban locales will experience shrinkage. Rural depopulation is no longer an unfortunate outcome of national economic success, but begins to affect all settlements of whatever size. If that starts to happen to lots of countries in the same region, it is bound to produce effects. I’m not sure yet if it has an impact on international relations other than the potential for changes in international migration patterns. Elsewhere in the world there are significant developments already occurring, for example in the EU with respect to shifting populations between shrinking and growing countries. Spain is shrinking, but receives a large number of migrants from growing countries such as the UK. However, many of these migrants are retirees who will not have any more children. So Spain might consider them a fiscal burden unless the UK and Spain can come to an agreement as to how to deal with the costs that migrants generate, particularly if they are not participating in the labor force. Add to this are the complications of Brexit, and the UK leaving the EU. Outside of that relationship, some other parts of the EU are shrinking, mostly at the subnational or regional level. The EU is aware of this and is working with member states to work out the most effective ways of balancing population flows. Research is beginning to show, for example, that the post 1992 east-west flows that came with accession of Eastern European countries to the EU are now being rebalanced by west-east flows as those countries develop and migrants return to their homelands. US President Trump recently pulled out of the Paris Agreement. On the other hand, Japanese Prime Minister Abe has seemed to form a substantive partnership with Trump. What could this diplomatic jostling and relationship mean for Japan’s environmental and depopulation process? I think Japan will probably continue its commitment to the Paris Agreement. Whether it is able to fulfill those commitments is another matter, given the country’s heavy investment in nuclear energy and the reluctance of the public to allow the authorities to restart nuclear power stations after the Fukushima disaster. It also depends upon the willingness of the Japanese authorities to incentivize renewable energy generation. The US may not improve its economic competitiveness by remaining on a fossil fuel dependent path, as the current administration states. So I don’t think Japan will face dramatic changes as a result of the recent US decision to pull out of Paris. It will take about four years for the effects to be felt anyway, as I understand. Beyond that I think Trump is trying to boost employment in the rust belt, and the US government has been hand in glove with the fossil fuel industry for decades. You can’t just take that hand out of the glove overnight. More to the point, I don’t think the US decision will have much of an effect on US-Japan relations because those relations are based on other things. Even if this does boost American industrial competitiveness, which I don’t think it will, it will be in areas that the Japanese don’t want to go into anyway. My reading is that Japan is committed to the Paris Agreement, and will probably be cooperating a lot with China in this respect. As I said before, there is an awful lot going on between those two countries, and I’m sure more will occur regarding renewable technologies and their implementation. So I doubt there will be much change in the way Japan and the US relate to each other. What is your teaching and academic philosophy? Academically, I am learning that we need to talk across disciplines much more, that scientists need to ask social scientists about how science works in the world outside the lab, and social scientists need to embrace scientific knowledge and draw it into their work. It seems odd to me that social scientists can so routinely ignore environmental change as a key variable in their research, as if somehow the environment is a constant, or that we will always be living in the same circumstances. I think social science really needs to wake up on these issues, particularly international relations, because environmental change is the biggest challenge that we face. And importantly, through learning about the science I think we can come to appreciate that this is not a future challenge. It is here already in our lives. The climate is changing, species are going extinct, our environment is becoming polluted and so on, already. We need to stop thinking about this as something to be faced tomorrow. In the UK, we have a set of views on IR that do not accommodate or provide solutions to the biggest international problems we face. That is partly because the worldviews of the political protagonists or leaders are constrained by their own personal experiences: there is an inability to understand the world from the perspective of ‘the other’. Binary discourses (‘good’ vs. ‘bad’) close down the opportunity for developing creative thinking and lasting solutions to these problems. The roots of understanding come from engagement and talking to people, listening to what others have to say. For young scholars, I think this is a real opportunity for developing a creative mind. For those going into fields such as diplomacy or politics, it is an opportunity to develop an understanding or empathy with people who disagree with you, and really trying to understand why they disagree with you. An issue, at least in the UK, is that our education system excessively individualizes the student. Our education system acts too much as a sorting mechanism for labor market entry, in which it treats each individual as a discrete unit of measurement, i.e. in the examination room, or in writing essays. This removes the individual from the possibility of collaboration and cooperation with others to achieve discernible collective outcomes. However, normal human activity is not like that. We cannot achieve what we want in life without collaborating and seeking out people who have complimentary knowledge, skill sets, and experiences that we can put together in teams where the combined achievements are much greater than the sum of their parts. We need to start cooperating much more at a young age, so we can develop communication, empathy and understanding that can help us develop creative solutions to complex problems – with the most complex problem, of course, being our impact on the environment. To try to see problems from the actors’ perspectives and trust their good intentions until they prove you wrong. To listen and learn from people with very different backgrounds and worldviews, and then to communicate with others in a way that respects their integrity but provides opportunities for everyone to rethink and rearrange their values and priorities. Fundamentally, doing this kind of research ultimately must have some kind of a purpose to contribute to a positive change in the world. That entails more than just publishing research for publishing’s sake. It means getting out there in the world and finding out what concerns people, what animates them and drives their behaviors, and researching those issues. It means finding the right language to communicate your knowledge and ideas, and that takes time and practice and interaction with people from diverse communities. Sometimes it means taking criticism and being able to deal with it. A colleague of mine says he learns most from people that disagree with him. So, that means really listening to others and sometimes eating a bit of humble pie! But don’t lose sight of what you want to do in life. It’s so easy to get sucked into conforming to living and working within the narrow horizons of institutional short termism. Keep doing what you do best, and do it often. This interview was conducted by Evangelina Moisi and originally posted on E-International Relations. Evangelina is an Associate Features Editor for E-IR.